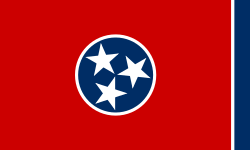 ↑ "State & County QuickFacts: Tennessee". United States Census Bureau. U. S. Department of Commerce. Retrieved 4 August 2012. الصفحه دى اتعدلت اخر مره فى 25 ابريل 2016,‏ 06:21.